Over a hundred large photographs, plenty of exhibit descriptions and a great amount of fascinating stories of the Polish road to freedom. The contents of this smart and handy exhibition guide will lead you through your first, or any further visit to European Solidarity Centre. An excellent gift if you are planning to invite friends to ECS, the guide offers a comprehensive course of the history of Polish peaceful revolution which resulted in the massive political change in Central and Eastern Europe. Apart from the accessible, lively descriptions, various titbits of information, and memories of historical heroes, there is also a rich collection of photographs presenting both the exhibition and the memorable events. 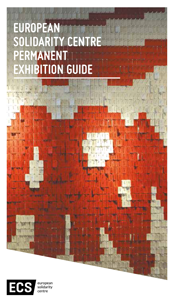 The guide follows the chronology of the exhibition and contains 3D visualisations of the exhibition site. All of this is accompanied by detail on the larger historical area in which Solidarność was born, and the ECS is now located in. We would like to warmly invite you to visit the permanent exhibition and to read the guide that accompanies it.